As companies naturally migrate their applications from legacy on-premises infrastructure to the public cloud and start using IoT devices to improve operational efficiencies, it’s easy for them to lose sight of their cybersecurity vulnerabilities that adversaries can exploit to break in. So, IT organizations are actively looking for risk assessment solutions that can proactively prevent attacks by reducing the attack surface exposed to cyber criminals. 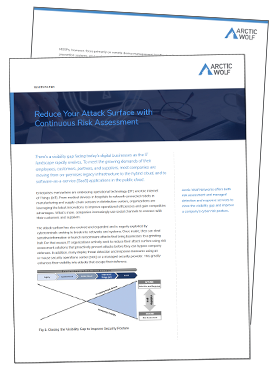 Discover ways your organization can firm up its security posture and reduce risk in Arctic Wolf’s white paper, Reduce Your Attack Surface with Continuous Risk Assessment. Learn how to reduce your attack surface and elevate your security posture. Download the white paper now! © 2019 Arctic Wolf Networks Inc. All Rights Reserved.